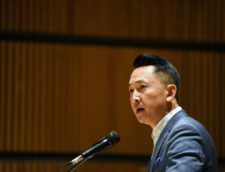 Aaron Baker of Michigan Daily reports on Viet Thanh Nguyen’s lecture about refugees and the Vietnamese perspective at the Lydia Mendelssohn Theatre. 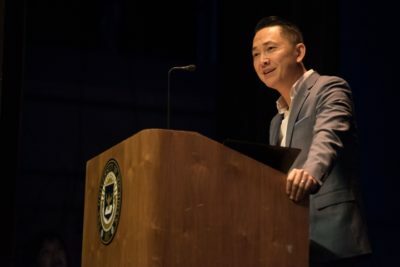 Pulitzer Prize-winning author Viet Thanh Nguyen, a professor at the University of Southern California, spoke Tuesday to a packed Lydia Mendelssohn Theatre on the perceptions of refugees and the Vietnamese perspective of the Vietnam War. 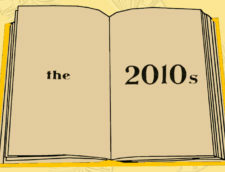 Using his own experiences and excerpts from his award-winning books, he also discussed the importance of storytelling. This event was put together by over 13 organizations, including the Vietnamese Student Association, the United Asian American Organizations, the University of Michigan Helen Zell Writers’ program. Prof. Emily Lawsin, an organizer of the event, introduced Nguyen, highlighting the crucial perspective he offers in such a turbulent time. 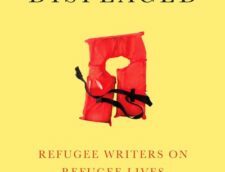 “A refugee at a time of rising xenophobia, a survivor of war in an era of ceaseless violence, a transnational visionary in the face of borders and walls, a writer of color in an age of resurgent white supremacy and, last but not least, a teacher at a time when we are bombarded daily with ignorance wrapped in 280-character spitwads,” Lawsin said. Nguyen, who is a Vietnamese refugee, started his talk by acknowledging his refugee identity, jokingly referring to his transformation “from refugee to bourgeoisie.” Nguyen and his family fled to the United States in 1975 after the fall of Saigon, settling in a refugee camp in Fort Indiantown Gap, Pennsylvania. He explained he still feels like a refugee because his earliest memories are of this time when he was separated from his parents and brother — a story parallel to the child-parent separation crisis of today at the U.S.-Mexican border. “That’s why I take it personally when I hear stories today about children being taken away from their parents, because I feel there is no justification of that,” Nguyen said. He then talked about the idea of “good” and “bad” refugees, describing the limitations of these one-sided views and emphasizing every person’s right in America to be mediocre, a line that garnered a lot of applause. Nguyen also spoke about U.S. and Vietnamese perceptions of the Vietnam War. He shared how the war wasn’t over for the Vietnamese people surrounding him in his refugee camp growing up with the losses and grief they still carried. He described himself feeling “split in two” while watching “Apocalypse Now,” at first being on the side of the American soldiers until he saw them killing Vietnamese. Through this movie and other media of its kind, he realized how powerful and destructive stories can be. “Stories can empower and stories can destroy us at the same time, and that’s one of the reasons why I became a writer,” Nguyen said. Throughout his talk, Nguyen read excerpts from four of his books: “The Sympathizer,” “Nothing Ever Dies: Vietnam and the Memory of War,” “The Refugees” and “The Displaced: Refugee Writers on Refugee Lives.” After sharing his stories, he held a question-and-answer session. In one response, he emphasized the need to write stories that bring people together. LSA junior Hannah Brauer read some of Nguyen’s books in her classes and appreciated the viewpoint he provided on the Vietnam War. She said something that resonated with her was his reference to a New York Times review for his book “The Sympathizer” that called it “the voice for the voiceless” when really those voices were just not being heard. Christina Do, an employee at Washtenaw Community College, is also a fan of Nguyen’s writing and relates to many of his experiences as her parents are also refugees of the Vietnam War. She talked about the power of seeing her identity represented by Nguyen. “The feeling of seeing someone who shares your experience, who shares your identity in some way, it’s an incredibly gratifying experience,” Do said.